The Tax-Collector's Office is one of approximately forty copies by the artist of a lost painting by his much more famous father, Pieter Brueghel the elder. It shows a group of poor Flemish villagers waiting patiently to submit their taxes not in cash but in baskets of eggs, poultry, game and other produce. 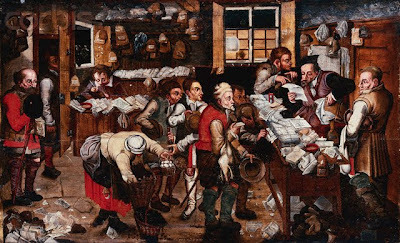 A prosperously-dressed tax-collector, assisted by a staff of half-witted clerks, is shown peering at a parchment behind a counter laden with piles of documents and money-bags. The artist mocks the wastefulness of this hive of bumbling officials by showing mountainous bundles of cancelled bills and receipts spilling carelessly across the office floor.